Windows 7 isn't just sleeker, faster and more productive, now it can cure the sick, too. 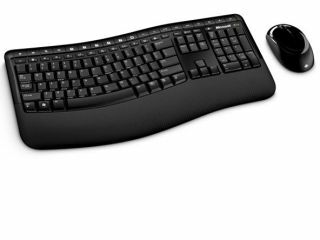 Microsoft has just released the Wireless Comfort 5000 keyboard for Windows 7, home to an "ergonomist-approved" Comfort Curve layout that encourages natural wrist posture with a slight six-degree curve. The keyboard has an updated soft-touch palm rest and low-profile quiet touch keys to avoid annoying your co-workers with clatter. What makes it a Windows 7 specialist are features like Taskbar Favourites. Instead of the traditional My Favourites Keys with stored locations, Taskbar Favourites map to the location of open applications on the new Windows taskbar. The icons in the taskbar can be rearranged by clicking and dragging, and Taskbar Favourites will instantly adapt to the new icon locations. The keyboard and mouse combo also supports Device Stage, a Windows 7 feature that gives users quick access to common tasks, including product information, registration and settings, for devices such as smartphones, cameras, printers and portable media players. A Windows Flip button pulls up a thumbnail preview of all open windows. A full-screen preview of each application will automatically display, enabling you to choose the programme you want. The included mouse has Microsoft's BlueTrack technology for use on a range of surfaces, and the whole kit works on the usual 2.4GHz band. The Microsoft Wireless Comfort 5000 keyboard is available for pre-order in the US now for $80 (£50).